Sheet music for "Loyola Mass," composed by B.G. Gross. Sheet music for "All Hail Maroon and Gold" by B.G. Gross, written in 1974. Sheet music for "Loyola Men," written by Mary Steffen and Art Wise during the 1930s as a stein, or drinking, song. 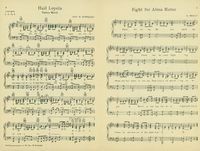 "Hail Loyola" & "Fight for Alma Mater"
Sheet music for "Loyola Loyalty Song," music by Louis Dvonch, lyrics by Ferdinance Vlazny, 1945. 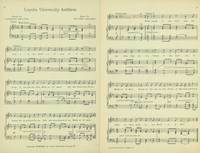 Sheet music for "March, Loyolans, March," written by Raymond Bellock, with music by Walter Dellers. Sheet music for "Loyola Anthem," written by Raymond Bellock, with music by Walter Dellers, 1931. Sheet music for "Hail to You, Loyola," composed by John Reinke, S.J., and Greg Luckhaupt, M.M., in 1986.